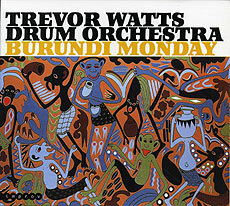 Peter Knight, violin; Mmadi Kamara, African percussion; Nana Tsiboe, African percussion; Ernest Mothle, bass; Liam Genockey, drums; Trevor Watts, saxophones. Recorded live at the 100 Club, London in 1983. Front cover (reproduced above) design and layout by Ewan Rigg.